Resolutions in honor of the Knights were read by Rep. Ron Bacon (R-Chandler, District 75) and Sen. Vaneta Becker (R-Evansville, District 50), both of whom represent Castle’s area. The Knights went undefeated in 12 regular-season matches and then won the bullseye division at the state NASP championship. They then won the Eastern National Tournament. At that event, 24 of the Castle archers each won a $1,000 scholarship as a result of their efforts. Indiana’s NASP program is coordinated through the DNR Division of Law Enforcement. For more on NASP, see indiananasp.com. Media contact: Tim Beck, DNR NASP Coordinator, tbeck@dnr.IN.gov, 317-694-7531. 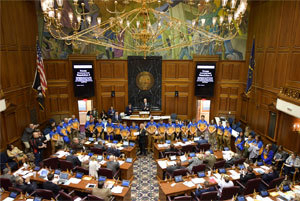 Photo cutline: Rep. Ron Bacon (center, with team), and the Indiana House of Representatives applaud the Castle High School archery team.